When visiting Pyrgos, make sure to wear comfortable shoes! As with most of Santorini's villages, cars are not allowed within the settlement and walking around is the only way to truly appreciate its mesmerizing beauty. The narrow, cobblestoned streets wind around the village, guiding your to a walk through history, where well-preserved neo-classical buildings stand side by side with residencies of traditional cycladic architecture and all paths lead uphill to the remnants of the imposing castle. When entering the village square you are faced with two options: you can either take one of the two pathways going up and continue going back to the ages until you get to the castle, or – if you are really into hiking – you can follow an old path that connects Pyrgos with Emporeio, and better appreciate the natural flow of the surrounding landscape. The castle of Pyrgos is a typical fortress settlement, where the community developed around the main tower at first, and then around the church of Agia Triada (Holy Trinity), which was built at a later stage. According to historical sources, there used to be at least 70 residencies within the castle walls, each belonging to a specific family. The settlement only had one entrace at its western side, which was bolded at night and whenever there was some kind of outside threat. But there was also a secret passageway, through which the inhabitants of the castle could communicate with the outer world, which unfortunately collapsed during the 1956 earthquake. The church of Agia Triada has been the centre of the settlement ever since it was first built. The female convent that was housed there was also destroyed by the earthquake, but has been renovated with the support of private initiatives and the community's efforts and has been operating as an Ecclesiastical Exhibition, since 1997. Its “Icons & Relics Collection” can be visited by the public during the summer period (April – October, +30 22860 31812). On the hill above Pyrgos, seats another place you must make sure to visit: the convent of Profitis (prophet) Ilias. Built at the early 18th century and located 567 metres above sea level, it offers probably the most breathtaking views of the entire island of Santorini. Just a few male monks live at the monastery today and the place can be freely visited by women as well, allowing a unique view of the monastic and ecclesiastical life, through a collection of well-preserved artifacts. If you happen to be in Santori during the Orthodox Easter, make sure to visit Pyrgos on the night of Good Friday to witness a magnificent tradition during the Orthodox Epitaph Procession: the children of the village place thousands of cans with small candles inside them all over the village, the castle and the monastery and they light them up during the procession, creating a magestic sight. If you are interested in learning more about Santorini's recent past, you can visit the Cultural Village which has been operating in Pyrgos and its “Vanishing Santorini” exhibition, from April until October (+30 2286031101). Santorini hotel "Spiliotica on the Cliff" / Book now! 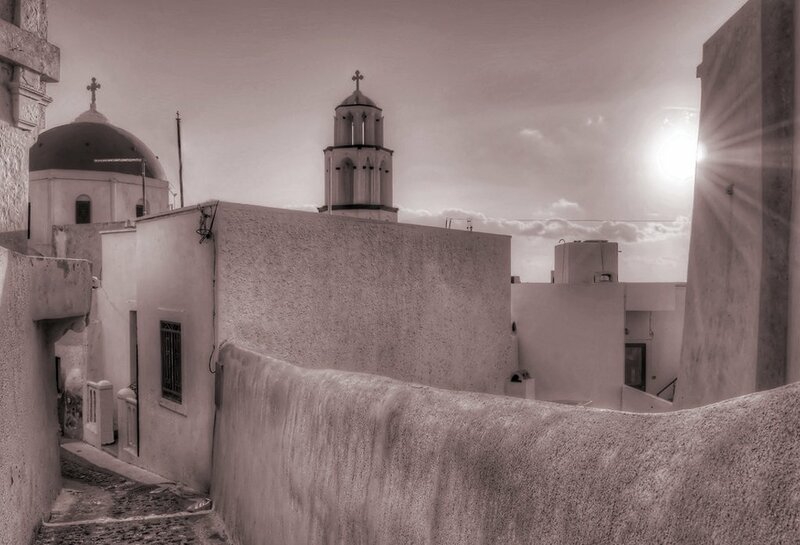 It might be a place with a long history, but Pyrgos remains a very active community today. With 600 permanent residents active in agriculture, tourism and wineries in the area, the village is full of life all through the year. Indeed, Santorini's first ever resident cultural association was formed here: Estia Pyrgou Kallistis Association (www.santorinipyrgos.com) was founded in 1949 and has since been rigorous in promoting the village's interests and social activities. Look out for the many interesting events organized by the Association (theatre and dance performances, exhibitions, cinema for children, lectures, educational excursions), as well as for the impressive library and study hall built and ran by them. 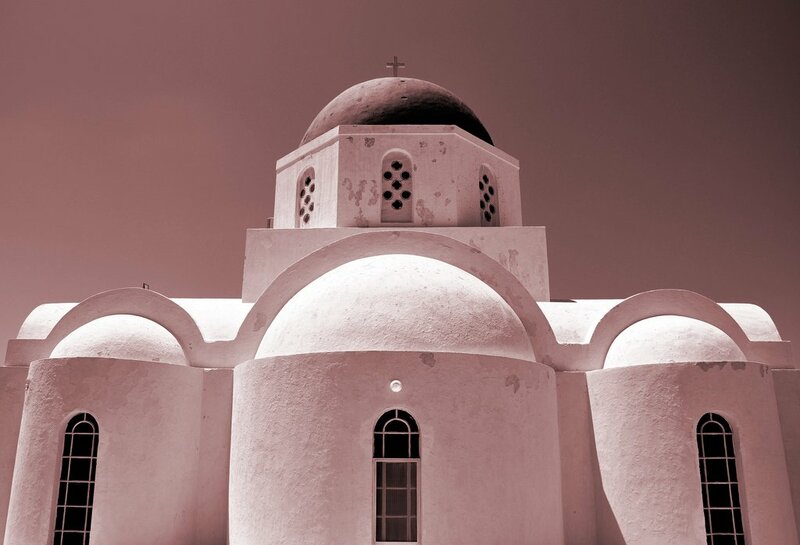 In 2012, they even collaborated with the village's businessmen and produced an iPad application, which serves as a comprehensive guide of Pyrgos in the English language and includes a wide selection of texts, images and video for the visitors to get to know their way around the place and its history. There are several boutique hotels and hostels operating in and around the village and great care has been given to their quality and the upgrade of the services they offer. All establishments have been renovated or built according contemporary and eco-friendly practices and offer local products in their breakfast menu. - Classical music & cocktails at Franco's branch in Pyrgos – it's quite a hike, but the view is definitely worth it!